Some dreams are worth dreaming. Some scores are bigger when the game ends. Some players are just special. 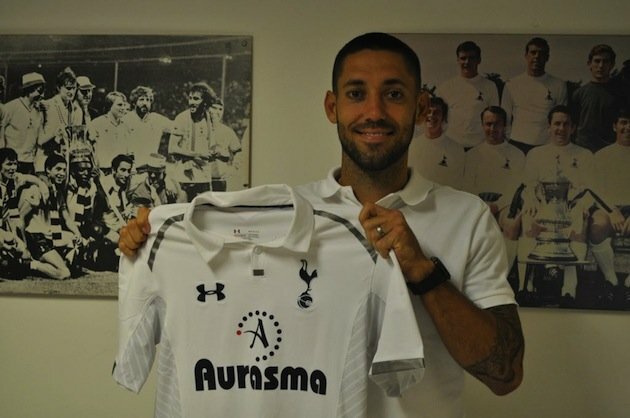 That was US international Clint Dempsey today for his new team, Tottenham Hotspur. Dempsey scored the game-winner against Manchester United at the famed Old Trafford and re-wrote the role of Americans in premier club soccer. Clint Dempsey's goal was special for several reasons. Besides the obvious significance of the rival, the very fact that the game was at Old Trafford and one that the Spurs had not won since 1989 elevates Dempsey's goal. Additionally, it brings Tottenham up to 5th place after a 3-game winning streak. It is a credit to Villas-Boas for acquiring the US international and starting him in important matches. Dempsey has a knack for scoring important, if we may say, scavenger goals. He seems to always be at the right place at the right time and has the presence of mind to adjust the speed and strength of his shots in order to break the goal line. This is what has made him such a threat during his career. Dempsey took his time and remained focused during a transfer season that he saw as his last chance to play for a major team in Europe. An 11th hour move to Tottenham was what he deserved, and after starting 3 matches, he found the back of the net in style. This is an American breakthrough because of who Clint Dempsey plays for, for his abilities on the pitch, and the path behind him. He elevates other Americans abroad playing for important teams like Michael Bradley (Roma) and Jozy Altidore (AZ Alkmaar) and sets up higher expectations for future United States talent. Dempsey has given us his share of important goals, from recent games in World Cup qualifying, to his goals for New England and Fulham, to unforgettable strikes versus Egypt and Spain at the Confederations Cup 2009, versus England at World Cup 2010, and the winner versus Italy on Italian soil earlier this year. He has added to his repertoire today by scoring for his latest, and most impressive club in the best soccer league in the world. Dempsey is pure American magic and we haven't seen all he can do yet. As the MLS season begins to wind down, a few locations in the attendance arena show some real patterns compared to years past. Nowhere is this more a fact than in New York. The Red Bulls may have 3 designated players in Thierry Henry, Rafa Marquez and Tim Cahill, but big bucks and a shiny, recently-built stadium haven't translated into the filled arenas seen in Seattle, Portland, Kansas City, Philadelphia and Houston. New York's deficit compared to last year now stands at almost 3000 seats. This is after a considerable positive jump in the past two years following the completion of RBA and the signing of Henry and Marquez. So what is it? Quality on the pitch? Hardly, in my opinion. Accessibility of venue? Nope. Style of play? Maybe. New direction for team? Perhaps. We will see after this season is complete. Maybe New York needs the other New York team to start playing. Another sore spot for MLS these days is Toronto FC. The once-gleaming venue for full stadiums and ardent fans, has now run into its 6th year of mediocrity. The team has yet to make it into the playoffs and the fans have begun to notice. What was once 100% attendance has since become 80%. The same fate could be in hand for the Timbers if they are unable to capitalize on a dedicated fan base. The most highly-regarded American international--Clint Dempsey--finally made a move out of mid-table Fulham FC of the Premier League to Tottenham Hotspur of the English Premier League during the closing minutes of transfer deadline in Europe. This after 5 stellar years with the London outfit and scoring 23 goals in all competitions during the 2011-2012 season. And even though his move was deserved, and that he flirted with teams like Liverpool and Arsenal, a more impressive effect has occurred: top European teams are buying American. It's true that this has happened before with the likes of Jozy Altidore making a move to Villarreal and Onyewu to AC Milan, but the back-top-back transfers of Bradley and Dempsey should have American fans excited. Now comes word that Maurice Edu, a top competitor and long-time player for the ill-fated Glasgow Rangers, is joining forces with Geoff Cameron at Stoke City. A new American Premier League team is born. If you were to start both at center back then you'd have the tandem that came away with a shutout at Estadio Azteca in the US' first ever win over Mexico on Mexican soil. Great selling point, right? Dempsey and Edu weren't alone today and in the recent weeks. Up-and-coming Terrence Boyd, a player with no professional experience prior to his recent games with the US U-23 and full national team, signed with legendary Austrian team Rapid Vienna and became a starting striker that already has 4 goals in all competitions. Add to this Alejandro Bedoya's move to Helsingborg, Mixx Diskerud's loan to Rosenborg, both whom have scored key goals already, as well as Onyewu to Malaga of the Spanish Primera, and we suddenly see that buying American is getting quite fruitful for teams in Europe. It remains to be seen, of course, how some of these moves will pan out. Bradley, aside from a recent injury, slid right into a starting role for Roma and has made a difference so far. So has Cameron. If Dempsey can crack the starting 11 for Spurs and if he can score consistently, then American soccer will finally have taking that extra step to become a provider of top talent for the world's most beautiful sport. And World Cup 2014 is right around the corner.